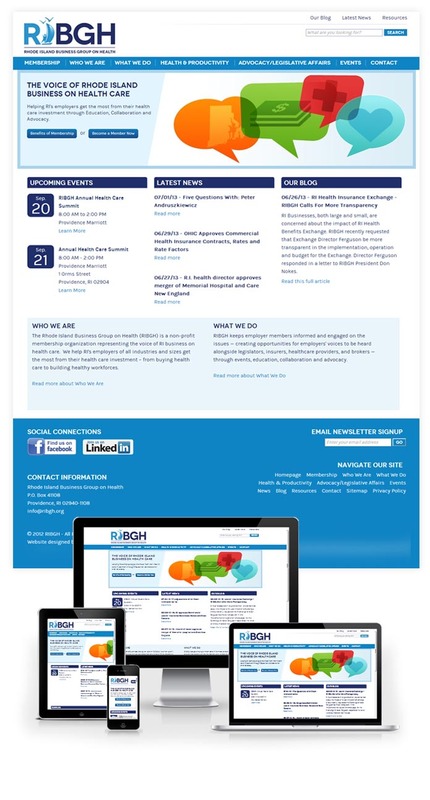 The Rhode Island Business Group on Health, or RIBGH, is a non-profit organization whose goal is to "help RI's employers get the most from their health care investment through education, collaboration and advocacy." When they came to Envision in early 2012, they were looking for a complete overall of the organization's brand - from their logo and printed materials, to their website and online marketing efforts, including email, social media, and more. With the new logo in place, we next began work on the website's design. The final, approved layout was one that I designed and I also created the HTML/CSS templates for the site, including the responsive design of the site so that it supports a variety of devices and screen sizes, before turning the project over to Envision's Lead Front-end Developer, Jeremy Spurr. Jeremy then built out the rest of the site and integrated it with the ExpressionEngine content management system. This entire project was a very consultative engagement from start to finish and RIBGH were a great organization to work with on this project. Routine strategy meetings and phone calls helped shape all aspects of this project to give RIBGH the online presence, and platform for growth, that was important for their continued success. You can see the new website at www.ribgh.org.